Recently a local Falmouth family had their “Black Lives Matter” yard signs stolen, and this isn’t the first time “Black Lives Matter” signs in our community have been stolen or vandalized. It’s a reminder that intolerance and racism are alive on the Upper Cape, even if many of us don’t always notice. In response to this most recent vandalism, Jarita Davis of Engage Falmouth is encouraging supporters of racial justice to put up “Black Lives Matter” signs in their yards all over town as a gesture of solidarity, not only with this particular family, but with all Black folk in our larger community who have been victims of similar acts. She approached Rev. David asking if UUFF would also put out a sign on our property. Moments after her request, Rev. David was also asked by the Falmouth Racial Justice League if our Fellowship would put up a sign. When we are asked to side with justice and love, how will we respond? Our Governing Board has responded to these requests, and a “Black Lives Matter” sign will be on our property, and visible to those driving by. The particular sign we’ll be using was designed by Matice (a Black artist), who is donating all proceeds to community programs led by people of color. If anyone asks you why we have this sign, let them know: we are a faith that believes in the inherent worth and dignity of every person, and that means Black Lives Matter. If you’re interested in getting your own sign for your property, there are a limited number left for purchase at Waquoit Congregational Church. The artist’s Etsy shop can also be reached here. 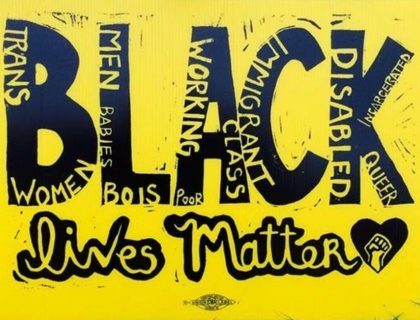 If you’re wondering why there is a slogan like “Black Lives Matter” rather than something broader, such as “All Lives Matter,” please consider some of the arguments here, including one by a UU minister. Debi Keller-Woods, our Director of Faith Formation, will lead a consecration of our sign during the Sunday service on July 29th. May we never be silent when truth and love call us to speak. As of today (August 17, 2018), two of our Black Lives Matter signs have been stolen. A third sign will be put out after this Sunday’s service. There has been a rash of these signs being stolen all over town. It is a true tragedy when messages of human worth and dignity so anger people that such messages are targeted for theft or vandalism; however, no amount of theft changes this holy truth: Black lives matter!